You really have to be a sushi lover to appreciate what this restaurant has to offer. It's an all you can eat Japanese buffet restaurant that doesn't require you to get out of your seat at all. As soon as you sit down, your server will bring you a menu that lists a variety of sushi, special rolls and other dishes you can choose from. All you have to do is mark down on a sheet of paper what you want and they'll bring it to you as soon as your food is ready. Their menu has an extensive list of all the Japanese food you can think of; teriyaki, sashimi, udon, tempura, and best of all, fried ice cream. This place has got the works! The only thing that I can think of that's missing from their menu is ramen noodles. But then again after eating all that sushi, you won't have room for anything else. Located right on the corner of Francis Lewis Boulevard and 191st street, the restaurant has a parking lot for its customers so you don't need to worry about finding parking. However it's rather small, so if you go during the weekend, it can get full really fast. Compared to other buffet restaurants like Harvest and Minado, Sushi Village offers a wider array of sushi to choose from. But don't expect to find snow crab legs and Peking duck on the menu. This is the place to go for sushi, if sushi is what you're craving for. The restaurant has a nice and welcoming atmosphere. It's reasonably priced, the service is good, and most importantly, their sushi is fresh. 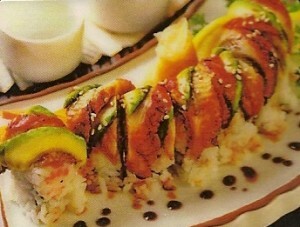 If you're planning on ordering special rolls, I recommend the lobster roll. Make sure you come hungry so you have enough room for dessert. Man, this place was outstanding when they first started to offer AYCE Sushi & Kitchen. My buddies and I frequented the place often. It wasn't too busy back in the day, so service was a dream. I have turned many friends and family on to this place, but lately, it has been a serious drag and cannot recommend it ever again. .. The last four times I've been there have been a complete disaster. I mean, the service was horrendous and IMHO they really do not care either way about it. If you dare, check it out for yourself - they almost always short your order. I guess they figured that you wouldn't be counting.. I'm so disappointed in Sushi Village, especially since they don't understand the meaning of good service. I'm not sure if they even care. They seem to be motivated by economics alone. IMHO, nowadays they have so much business that they do not care about the individual or the individual party that dine there. I speak from experience; your mileage may vary. They're like the used car lot salesmen of Sushi. As long as they get everyone in there once they're happy. They must love it when knuckleheads like me show up repeatedly; not anymore mind you!!! When I got back to my seat I could not believe my eyes!!! They removed if from my table. That was indeed the last straw for me and Sushi Village.. I went back to the manager and asked her why this happened. She seemed to not care much about what happened;.. Believe it or not, the manager and my waitress were having a hard time holding back their smiles. They were having fun with my predicament and that is not acceptable under any circumstances. The more folks realize where their true heart is, the more folks will understand that they do not care about servicing the individual; they seem to only care about the money they're bringing in. I cannot see how a curt and uncaring service staff can keep a restaurant like this going much longer, but I guess the $20.00 meal ticket could be just the right blinder for many folks. That being said, in time, I believe others will see and experience exactly what I went thought the last few times I've been there. I hope Sushi Village sees the big picture and consider doing a better job providing outstanding service, because good food is only as good as the service that was provided..
Keep in mind, even if they step up the quality of their service, make sure you get what you asked for because they WILL bag you in that department. I know this because they have done it each and every time we were there. Sorry to hear about your bad experience. That actually has happened to me a few times I was there. We had to order the same dish several times because it never came. I just assumed they forgot our order since we went to eat on a busy night. Let's hope they start improving their service.